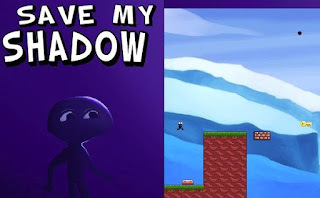 Save My Shadow is a new platformer adventure game from Mapacarta. In this game, your mission is to save your shadow by completing all 20 levels full of enemies, cannons, axes, moving blocks and spikes. Don't worry, you won't be going all through that without a weapon - you have a gun but with limited bullets so use them wisely. The gameplay is not new but it still offers a good gameplay experience. While the art style of it simple, the level of difficult is fair to moderately challenging. Meanwhile, here is Save My Shadow walkthrough for those who needs it.